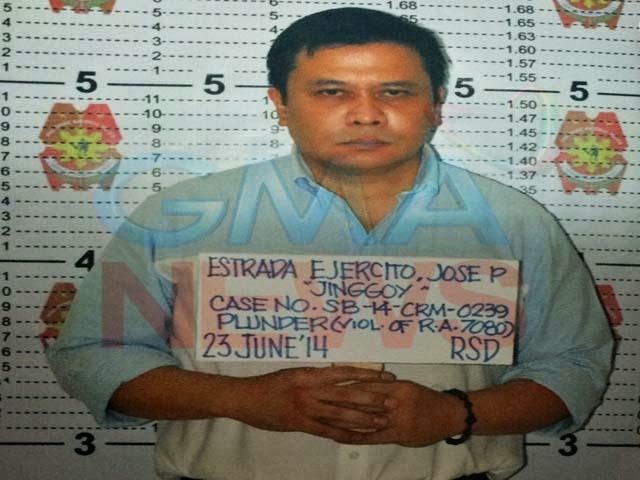 Manila, Philippines - Mugshot of Jinggoy Estrada surfaced online on Monday night, June 23, 2014 as posted by GMA News despite the order of Philippine National Police (PNP) that it won't release mugshots of plunder- accused senator due to the request of his family. Estrada gets this mugshot taken by the PNP during his booking procedures at the PNP Multi-Purpose Hall. Senator Jinggoy Estrada has surrendered to Sandiganbayan on Monday upon being notified of the issuance of a warrant of arrest against him, in connection with charges of plunder and graft. The Sandiganbayan earlier issued a commitment order to detain Estrada at PNP Custodial Center. Estrada will soon become cellmate of Sen. Ramon "Bong" Revilla Jr. who was jailed last Friday, June 20. "I never stole a single centavo from government coffers," a Estrada told mediamen, as he accused President Benigno Aquino of playing politics and cracking down on his opponents. "At the end of the day, I will prove my innocence. I will face all charges against me in court," Estrada said. Meanwhile, the Presidential Spokesperson Edwin Lacierda also gave statement and it says: "The issuance of this warrant is a step forward in finding out the truth, which is fundamental in strengthening the trust of our people in our institutions and processes." "As the Sandiganbayan works to fulfill its mandate, we ask the Filipino people to remain vigilant throughout this process, bearing in mind that the outcome should clearly reflect the profound reality—that just as every Filipino is accorded constitutional rights, these rights are to be protected in a manner that is just and in the service of the truth," Lacierda added. Estrada is the second high-profile official arrested within days over a controversial corruption. Estrada is accused of pocketing P183 million in pork barrel scam kickbacks after allegedly channeling his priority development assistance funds to bogus non-government organizations of Janet Lim Napoles. It was also reported that the senator and his wife, Precy Vitug have renewed vows a day before the anticipated arrest. The couple were surprised by their family with an early silver wedding anniversary celebration.